Reference number for this case: 24-Sep-54-Bayonne. Thank you for including this reference number in any correspondence with me regarding this case. Bayonne, September 24. -- Residents of Bayonne claim to have seen, this afternoon very high in the sky, three mysterious objects, of light color. A policeman, Mr. Corrions, who was in the district of Les Halles, observed three motionless machines laid out in a triangle. "They had", he said, "the shape and the dimension of a rugby ball and appeared to be at a considerable height." Passers by stated to have seen the same luminous objects from other locations. Clermont Ferrand. -- Six residents of Langeac (the Haute Loire) saw a white gleam moving in the sky in direction of the ground. La Rochelle. -- At La Charron (the Charente Maritime), three fishermen and a customs observer state to have seen, during one of these last nights, a formation of flying saucers moving very low and flying over the shore, before disappearing. The sky of France is furrowed by "cigars" and "flying saucers"
Paris. September 25. -- From several localities of France, the appearance of "cigars" or "flying saucers" in the sky is reported. Thus in Charron (the Charente-Maritime), three fishermen and a customs officer state to have seen during one of these last nights, a formation of flying saucers evolving very low and flying over the shore before disappearing. From Villefranche-de-Rouergue in the Aveyron, it is reported that an owner of Vabre-Tézac, Mr. Marre, saw a yellowish mass of color which moved away towards the south, without leaving behind any trace of smoke. 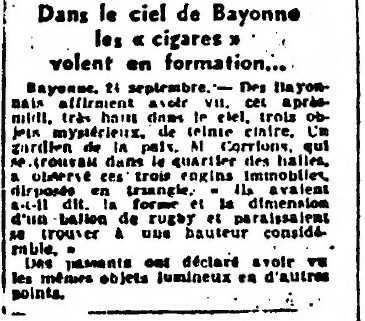 Aimé Michel notes that on September 24, 1954, there was a sighting in Bayonne. He indicates that this case happened in the afternoon, when a large number of people saw three elliptic objects very high in the sky, which were motionless, of metallic aspect and shining in the sun. Their immobility lasted a long moment, "after that they disappear quickly." He reasons that at first sight the weather balloon seems to be an explanation but that the ellipse is horizontal and not vertical, and that there is a fast departure. Jacques Vallée indicates that for the day of September 24, 1954, the French Press mentioned a number of sightings, including one in Bayonne in the Pyrénées-Atlantiques in the afternoon. Jacques Vallée indicates that the observation of type "III"; which he defines as "a case where an alleged 'abnormal object' of spherical, discoid or elliptic form is reported motionless in the atmosphere." He indicates it was "a triple image or object". Let us take another day, the 24th of September. Nine observations that day. On the nine, six are on the same line going from Bayonne to Vichy. 6. Bayonne, afternoon: Many people watched three elliptical objects, metallic in appearance, hover in the sky, and then move away very rapidly. The two authors note that the observation in Bayonne of September 24, 1954 was used as a basis for Aimé Michel for his description of an alignment "Bayonne-Vichy" (BAVIC). Around 4 p.m., many people, among them several policemen the ensuring circulation downtown observed during nearly a quarter of an hour three elliptic objects, very high in the sky, motionless, of metallic appearance, shining with the sun. A police officer, Mr. Corrions, who was in the district of the Halles, specified: "They had the dimension of a rugby ball. They were in triangular formation." Like all the other witnesses, Mr. Carrions saw the three objects suddenly passing from a quasi complete immobility, to a very high speed and disappearing quickly in a north-western direction. The two authors report that in Bayonne in the Pyrenees Atlantique, on September 24, 1954 at 04:30 p.m., three objects laid out in triangle were observed. The two authors indicate that depending to the newspaper that one chooses, this case is dated sometimes of September 23, 1954, sometimes of September 26, 1954. They add that the sighting is poor in details and could be explained by anything. Ufologist Michel Jeantheau closely checked the date of this observation allegedly being the starting point of an alignment of sightings pled by ufologist Aimé Michel and called "the BAVIC line" for "BAyonne-VIChy." He indicates to have found in 1976 in the National Library in the daily newspaper of Bayonne "Côte Basque Soir" for September 24, 1954, that this observation is indicated as of "yesterday afternoon around 17 hours," which indicates that the correct date is September 23 and not on September 24 as Aimé Michel thought it was. He also found the case mentioned on page 3 of the regional newspaper La 4ème République des Pyrénées for September 27, 1954, with the indication "Thursday afternoon around 17 hours"; which also places the case at September 23, 1954. He thus notes that Aimé Michel was mistaken when he indicated that his source was the newspaper Le Parisien Libéré for September 27, 1954, since the article in question is really in this newspaper at the date of September 25, 1954. He adds that the authors Barthel and Brucker in their book "La grande peur martienne" wrote that certain newspapers date the case as of the 26th, others as of the 23rd, and that "a doubt remains" on the date, despite that he has informed them of the correct date before, which is not dated 26th or 23rd in any newspapers. The author indicates that on September 24, 1954, there were 9 sightings, 6 being on the Bayonne - Vichy line, one of those sighting was in Bayonne. The Belgian ufologist indicates that in 1954, on September 24 in France, in Bayonne "At 4:30 observations of three objects laid out in triangle." 1954 - At sometime before 3:00 p.m. in Bayonne, Pyrenees-Atlantique, France three metallic ovoid objects hovered in a triangular formation for over one minute, then flew away fast. At 3:00 p.m. a fast silent cigar-shaped object crossed the sky slowly over the Vichy stadium, Allier, France and was seen by many. These are two of the defining sightings of the Bayonne to Vichy (BAVIC) orthotenic line discovered by Aime Michel and confirmed by Dr. David R. Saunders. (Sources: Aime Michel, Flying Saucers and the Straight Line Mystery, p. 76; David R. Saunders, Is BAVIC Remarkable?, FSR, Vol. 17, No. 4, July-August 1971). Luc Chastan indicates that in the Pyrenees Atlantique in Bayonne on September 24, 1954 at 16:30 hours "Many people including several policemen observed during a quarter of hour, three elliptic objects very high in the sky, motionless, of metallic appearance, which are shining with the sun. They had the dimension of a rugby ball and were in triangular formation. Suddenly they passed from a quasi total immobility to a very high speed and disappeared quickly in direction of the Northwest." The sources are noted as "Ovni, Premier dossier complet... by Figuet M./ Ruchon J.L. ** Alain Lefeuvre pub. 1979" and "Face aux Extra terrestres by Garreau and Lavier ** DELARGE 1975,". The website indicates that on 24 September 1954 at 15:00 in Bayonne, France, "Three metallic ovoid objects hover in triangular formation for over one minute. Fly away fast." And: "Hovering objects were observed. Three metallic ovoid objects were observed by a male witness on the shore for over one minute." [---] Article in the regional newspaper Côte Basque Soir, France, September 24, 1954. [pl1] Article in the national newspaper Le Parisien Libéré, Paris, France, September 25, 1954. [---] Article in the regional newspaper La 4ème République des Pyrénées, France, page 3, September 27, 1954. [am2] "Oui, il y a un problème soucoupes volantes! ", article in Planète magazine, France, by Aimé Michel, 1963. [fs1] "The Scientist and the UFO", article by Frank B. Salisbury, Utah University, in Bio-Science, USA, vol. 17, n° 1, pp. 15-24, 1967. [---] "Is BAVIC Remarkable? ", article by David Saunders, in the ufology magazine Flying Saucer Review (FSR), U-K., Volume 17, #4, July/August 1971. [gl1] "Face aux Extra-Terrestres", book by Charles Garreau and Raymond Lavier, Delarge publisher, J'ai Lu, France, page 228, 1975. [bb1] "La Grande Peur Martienne", book by Gerard Barthel and Jacques Brucker, Les Nouvelles Editions Rationalistes publishers, France, page 137,174, 1979. [---] Article by Jacques Scornaux in the ufology magazine Inforespace, SOBEPS, Belgium, page 48, #49, January 1980. [mj1] "Que devient BAVIC, ou la journée du 24 septembre 1954 revue et corrigée", article by Michel Jeantheau, reprinted in "Le dossier 1954 et l'imposture rationaliste", book by Jean Sider, Ramuel publisher, France, pp 138-140, 1997. 1.1 Patrick Gross February 10, 2010 Conversion from HTML to XHTML Strict. First formal version. Additions [jc1], [go1], [jb1], [dj1], [ud1]. 1.4 Patrick Gross January 12, 2017 Addition [ub1]. 1.5 Patrick Gross February 10, 2017 Addition [er2].